“Lucky are you people – the Nyishis, whose elders started celebrating Nyokum Yullo in a centralized form 50 years ago in 1967 at Joram and today we take pride in celebrating its Golden Jubilee,” said Chief Minister Pema Khandu while wishing all on the festive occasion at Joram here today. Asserting that loss of culture is loss of identity, Khandu hailed the Nyishis for upholding, preserving and passing on their culture to the next generation, irrespective of religious affiliations. 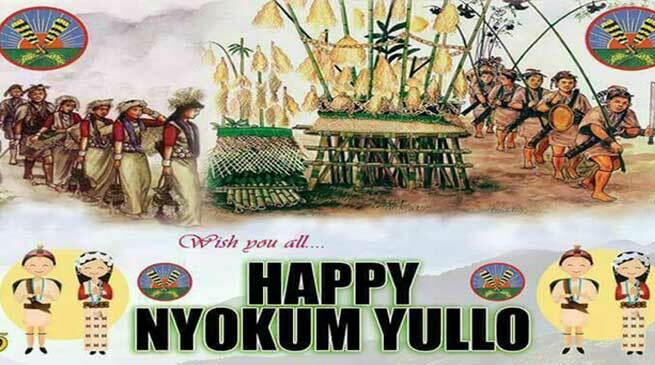 He said the Golden Jubilee celebration of Nyokum at Joram is a proof of the Nyishis’ deep rooted connect with their culture. Thanking the people for keeping faith on the government, Khandu said that he is committed to empower the villages and those in the grassroot like the institutions of panchayati raj and Gaon Burahs. “Arunachal will not develop unless our villages are developed and the rural local bodies are empowered. In the days to come you will witness decentralization of power. I promise,” he said. Responding to a demand submitted by local legislator Likha Saaya, Khandu reiterated that he personally is not against creations of sub-divisions, circles and even districts. “I am not against your call for creation of Panyor district. However, this demands huge financial involvement and other official procedures. We will discuss it in the highest platform and do what is best,” he said. Khandu, however, ceded to the demand for establishment of a Nyishi Heritage Museum at Joram and assured to take up the issue with the Union Ministry of Culture. He also announced that the divisional commissioner’s office and the office of the DIGP, as decided by the erstwhile government, will be established soon in the area. He said several zonal divisions of departments that are functioning from the state capital Itanagar will be moved to their respective zones for better administration and implementation of welfare projects. Talking about governance, the Chief Minister informed that he has made it clear to his cabinet colleagues that only ‘efficiency’ will be the criteria to stay in their respective portfolios. He said every three months ministers will have to submit the progress reports of their respective departments. “I have to submit the cumulative review report of all departments every three months to the Prime Minister. Unless and until we have a positive review report, I won’t be in a position to face the Prime Minister,” he explained. Asserting that he is not a partisan politician, Khandu said that his agenda is holistic development of the entire state and not playing party politics. “All the sixty constituencies are my priority irrespective of which party it belongs to. Developmental funds will be equally distributed and I would insist its judicious utilization with corruption at bay,” he said. Khandu beckoned the people to cooperate with the government in capitalizing on the state’s vast natural resources and potentials. He said the image of the state as a ‘state with a begging bowl’ will have to be done away with. “We as chief minister, ministers and MLAs will have to vacate the chair one day. Till the time we sit on the chair we have to work for the people and the state’s development,” he added. The Nyokum Yullo Golden Jubillee celebration was also attended by Union Minister of State for Home Kiren Rijiju, PHE & WS Minister Bamang Felix, Parliamentary Secretary Likha Saaya, district officials and distinguished members of the Nyishi community. Surviving pioneers of the first Nyokum celebration at Joram fifty years ago were felicitated on the occasion while women, who were part of the 1967 Nyokum celebration, presented an exclusive ‘Rikham Pada’ dance to add to the fanfare. ← Don’t be a victim of car theft……..